Nauset celebrated after winning the girls central south sectional meet. Marrkand closed out a remarkable career by winning the Division 1 state title in the 200 IM, in a state and meet record time of 2:01.56. She also won the 100 back state title in a state record time of 54.08. The 10-time All-American will attend Virginia. Chamberlain earned the Division 2 state title in the 100 backstroke after taking top honors in the South Sectionals in the 50 and 100 free. She is the reigning national champion in the backstroke. Alexander owned the 200 free this season, winning the Northeastern Conference title and North Sectional title, and also winning the 500 free at sectionals. 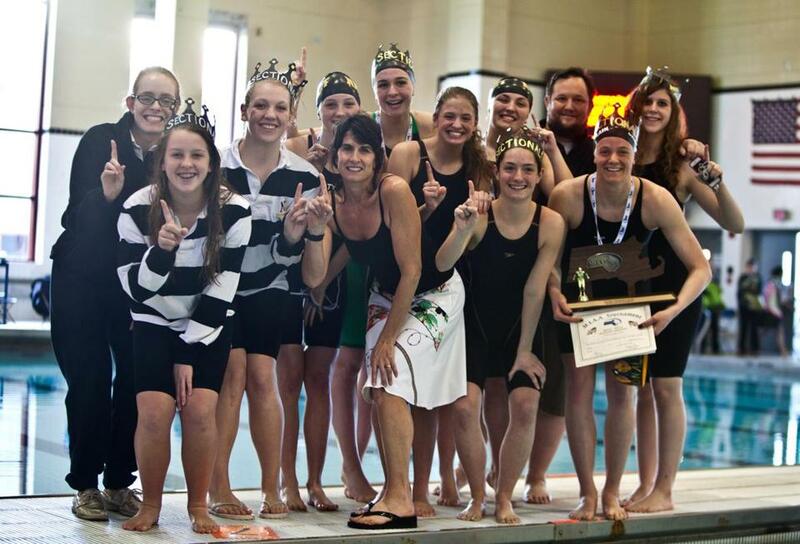 She also helped the Headers to a win in the 400 free relay at states. Bryson capped a solid career by earning a state championship in the 50 free and finishing third in 100 free at the Division 2 meet, earning All-America consideration in the 50. A four-time DCL-All star and 2012 All-American, she is undecided on college plans. Cronin showed off her versatility, earning the NEC title in the 50 free, the North Sectional title in the 100 free, and the Division 2 state title in the 100 butterfly. She also helped win the 200 IM and 400 free relays at states. Garber blew away the field in the 100 breaststroke, setting a school record while winning the North Sectional and Division 1 state championships. Her time of 1:03.63 at states was a meet record and earned her All-American honors. O’Brien dominated on the board, sweeping the Dual County League, North Sectional, and Division 1 state titles. A three-time state champion and two-time DCL All-Star, she competes for USA Diving year round. Pierce helped lead Wayland to its third straight Division 2 state title and earned her own individual state title in the 100 breast. She added a second in 200 IM, earning All-America consideration. The New England Prep School record-holder in the 100-yard butterfly (54.2 seconds), Reis earned fifth place at Nationals in December in the 200 fly. She was an All-American in the 100 fly after being named EIL Swimmer of the Year and NEPSAC MVP. Swensen earned top honors at the Division 1 state meet in the 100 butterfly, blitzing the field by more than two seconds and setting a meet record in 55.41. She also finished second in the 200 IM at states. Thompson captured the Division 2 state diving championship for the second straight year. She owns the school record in both the 6 and 11 dive competitions. A three-year DCL all-star she is also a high honor student. Lincoln-Sudbury had a strong showing at the Division 1 states, finishing second thanks in large part to a win in the 200 free relay. Goswami opened before handing it off to Brown, who brought the Warriors back into second, setting the stage for Baker, who turned in a blistering leg of 24.04. Anchoring things was O’Shea, who swam the fastest leg in the race (23.78), which was enough to edge Westford. The route to the Division 1 state title started in the very first race of the meet for Westford, which happened to be one of their best, the 200 IM relay. Marrkand set the tone by opening a two-second lead. Gosselin maintained the advantage before turning it over to Martin and Kea, who closed out the win in a state-record 1:46.39. After capturing the North Sectional title in the event, this talented quartet closed out the Division 2 state meet with a win in the final event. Alexander was second after her leg, but Ronan followed with the fastest second split. Cronin swam the fastest third leg to build on the lead for Verrette, who held off a surge from Northampton and Wayland to win in 3:33.54. In his ninth season, Hanchett led the Chieftains to an undefeated dual-meet season en route to earning the Cape Ann League title. His squad also earned the MIAA sportsmanship award. A California transplant and Gordon College grad, he enjoys surfing and swimming. Walsh coached Duxbury to an undefeated Patriot League season and an eighth-place finish at the Division 2 state meet in her fourth season. A 2006 graduate of Marshfield, she swam all four years at UMass. Bay Colony — Nauset: Marie Chamberlain. Catholic Central — Archbishop Williams: Victoria Butterfield. Arlington Catholic: Jess Higgins. Austin Prep: Andrew Baker, Meghan Bodette, Ashlyn DeRoche, Olivia Lloyd. Bishop Fenwick: Lindsey Andrews, Carson Christuk, Nicole DiMelgio, Bridgette Townsend. Cardinal Spellman: Chris Grinnell. Marian: Yoon Nam, Parker Yan. Matignon: Sophia Arredondo, Courtney Barr, Amanda Brennen. Dual County — Bedford: Laura List. Concord-Carlisle: Rachel Andre, Abby Gramaglia, Meghan O’Brien, Emily Roberts, Cassidy Smith. Lincoln-Sudbury: Ansley Baker, Courtney Brown, Caroline Goswami, Katherine O’Shea, Kim Yang. Newton South: Jessica Zernitsky. Wayland: Lori Cliff, Anna Downs, Madison Kiefer, Mindy Lou, Molly Pierce, Maddi Sacra, Lizzy Wells, Heather Wright, Becca Wuerfl. Westford: Emma Gosselin, Grace Gosselin, Ali Kea, Jen Marrkand, Courteney Martin, Hannah Rosenstein, Mara Tynan, Tori Weinstock. Weston: Danielle Barenholtz, Caroline Bryson, Victoria Bryson, Christina Chiocca, Paige Holman, Anna Nuefeld, Mikaela Thompson, Anna Tseng. EIL — Bancroft: Eric Chang, Kim Le. Berwick: Jenna Hayden, Tess McNamara, Isabel Reis, Emma Whall. Dana Hall: Nicole Barbieri, Abby Benkert, Amelia Benkert, Emma Benkert, Belinda Donohoe, Maddie Walsh, Justina Zuckerman. Pingree: Erin Cunningham. Portsmouth Abbey: Annie O’Donnell. Hockomock — Attleboro: Sarah Nordberg. Canton: Tiffany Ha. Foxborough: Lexi Nelson. King Philip: Ellie Lambalot, Cara McCarthy, Holland Nievergelt. Mansfield: Abbie Grant, Brooke Harrington, Rachel Long, Maeve McGowan, Emily Weiner. Milford: Maddison Garber, Allie Piergustavo. North Attleborough: Sarah Blanchard, Aidan Devers, Julia Hausmann, Andie Rigas, Catherine Roukhadze, Adi Tobias. Oliver Ames: Ashley Branagan, Jacquey Gover. Sharon: Liza Krause, Tara Zhou. Taunton: Lorna Li. Northeastern — Beverly: Sarah Welch and Astrid Swensen. Marblehead: Ryan Alexander, Anne Arthur, Kylie Cronin, Kira Daher, Haley Ohlson, Ellie Ronan, Hannah Verrette, Sophie Zmetrovich. Patriot — Duxbury: Katie Eagan, Jess Goldberg, Hannah Hutchinson, Michaela Morris, Emily Nichols, Mary O’Sullivan, Avery Pisani, Sydney Rangulong, Meredith Van Dingstee. Hanover: Alex Kelly, Calley Madison. Hingham: Lily McCarthy, Cece O’Reilly. Middleborough: Abby Bailey. Scituate: Katelyn Capprini, Kendra Miller. Silver Lake: Lindsay Kalinowski.